Advisors - Can You Spot a Naturopathic Student? Welcome, Pre-Health Advisors and Counselors! The Association of Accredited Naturopathic Medical Colleges (AANMC) wants to hear from highly motivated, qualified, outstanding candidates who want to make a difference by working as a Naturopathic Physician. This requires earning the Doctor of Naturopathic Medicine (ND) degree from an program accredited by the Council on Naturopathic Medical Education, the USDE recognized agency. NDs practice primary care and address the causes of disease, restore deficient determining factors of health and always attempt to support the body’s ability to heal. They use therapies such as nutrition, botanical medicine, physical medicine and more. Together, with your expertise as a pre-health advisor and our extensive resources, we can help students who would be fulfilled in a career in naturopathic medicine navigate the journey to enter their training. 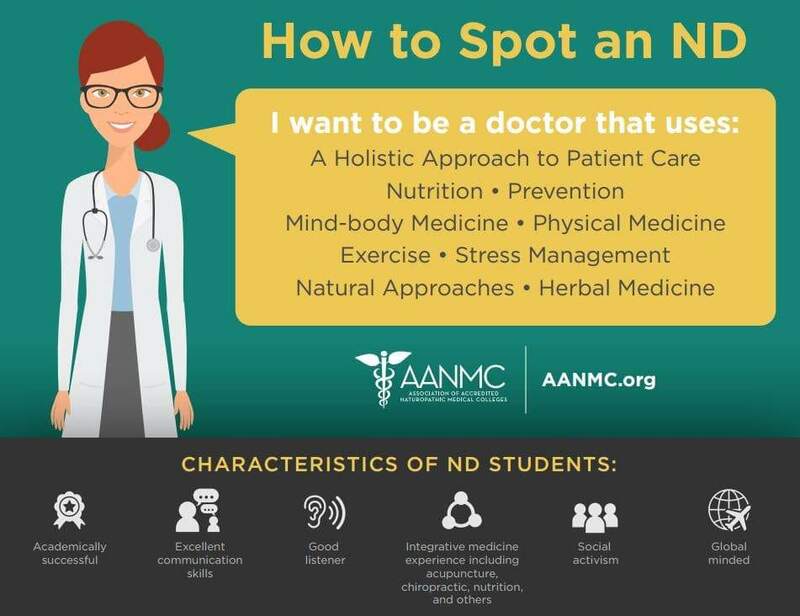 We invite you to learn and share what it takes to become an ND – a rewarding career path offered at eight CNME affiliated North American naturopathic medical schools. Naturopathic medicine will appeal to those students who see the tide of poor health – rising incidence of diabetes, obesity, heart disease, dementia and mood disorders – and want to do something to impact the health of their community. It is a people focused field that requires a lot of entry knowledge and skill. A Naturopathic Medicine career can be satisfying across many areas – remuneration, quality of life, flexibility and career satisfaction – that is what our alumni tell us. Please join us in helping to define the future of health care by introducing promising young doctors to the field. Never miss our latest news, resources, and event invites, designed to help you prepare your students for an education and career centered around naturopathic medicine. Accredited Naturopathic Medical Schools – Familiarize yourself with the six AANMC programs across seven North American campuses. Preparing for a Naturopathic Medical Education – Become well-versed in up-to-date admissions requirements, application processes, and financial aid resources to chart an individualized game plan for prospective candidates. Comparing ND & MD Curricula – When comparing the training and philosophies of NDs and MDs, it’s important to remember that each field is unique and offers distinct benefits to patients and the medical field as a whole.